Martin’s research has changed how many leaders think about diversity. He challenges leaders and diversity professionals to see diversity as much more than learning about race, gender, and other social groups. Rather, he advises leaders to examine and leverage the differences that matter most to achieving the mission and goals of the organization. His work shows how leveraging difference generates innovation, engagement, and business results. His upcoming book , Embrace the Weird will focus on individuals who are on the margin, who are a little bit different, or who don’t seem to quite fit in. He and his research team have identified a diverse collection of these “weird” people who have found a way to thrive. His book tells the story of their secrets and invites all of us to reveal our weirdness in productive ways. In collaboration with the Batten Institute for Entrepreneurship and Innovation Martin has contributed two bodies of work to the Batten Briefings series: Diversity That Matters, (2004) and Leveraging Difference for Organizational Excellence, (2003). In Chapter 7 of Exploring Positive Relationships at Work: Building a Theoretical and Research Foundation (2007), Martin Davidson and Erika James explore the engines of positive relationships across difference, conflict, and learning. Martin began his unique path towards Leveraging Difference at Harvard, earning his AB in Psychology & Social Relations in 1983. He earned his PhD in Social Psychology from Stanford University in 1988, Personality. The topic of his dissertation, entitled Distinguishing Repressive Coping from Impression Management, served as the beginning of his career-long exploration into emotion, conflict, and differences in identity. That work evolved into his current work—a unique approach to managing diversity, leveraging difference, and developing talent in organizations. Martin teaches the Leading Organizations core course at Darden for Residential MBA students. During his tenure as head the course, he orchestrated innovations that helped make the course among the most successful at Darden. He also teaches two elective courses, Interpersonal Behavior and Leading Diversity and Leveraging Difference. He has also written dozens of case studies, experiential exercises, and technical notes used in teaching MBA and Executive Education classes. These teaching materials help future and current leaders develop their skill in designing and managing organizations that perform at the highest level. 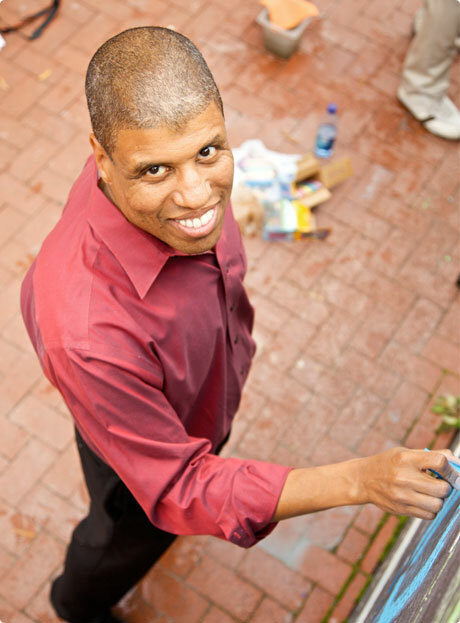 Martin is a trailblazer: he is the first African American ever tenured and the first to be granted a chaired professorship in the history of the Darden School. He currently serves as Senior Associate Dean and Global Chief Diversity Officer for the Darden School, leading the effort to create a more diverse and inclusive environment for faculty, administration, staff, and students. Martin loves music and was an accomplished bass player earlier in his career. As a youngster he earned a number of awards for his musicianship and had the privilege of performing as a member of the world renowned Cleveland Orchestra. In the past decade, he has developed a passion for travel that has taken him to Africa, Asia, Europe, and the Americas. He and his wife, Rachel Bagby, reside on their solar-powered farm–Singing Farm–near Charlottesville, Virginia.